A friend recently remarked to me that her dealer was on home detention. That's nice. Wouldn't want to see people who are perpetrating victimless crimes locked up in prison. And the dealer has found a lucrative job he can do from home. I was reminded of this tidbit by new figures for home detention. There has been a 60 percent increase in people serving such a sentence since judges were allowed to impose one. In 2007-08, 2677 people were on home detention sentences or orders, up from 1672 on home detention orders in 2005-06, a 60 per cent increase. It occurs to me this may largely be another (new) aspect of the state's farcical war on drugs. Still I would rather live in a country that puts up a show of fighting soft drugs than one that actually brings all it legal might down on the activity. Oh Golly. This is exciting. When did a political party last have a policy to create "new, affordable" campsites? Thank you National. That's high on my list of priorities for something a government should be focusing on. From October 2008, the Employment and Support Allowance will replace Incapacity Benefit and Income Support claimed on the grounds of incapacity for new customers. The new system will consider what an individual is capable of, and what help they need to manage their condition and return to work. A new test, the Work Capability Assessment, will be introduced in October 2008 alongside the new Employment and Support Allowance and will be applied to all those people claiming the new allowance. The new test is more robust, accurate and fairer. It will replace the current Personal Capability Assessment, which is weighted more towards a person’s physical disability and bases itself around assessing people’s incapability for work. The Work Capability Assessment will look at people’s physical and mental ability, including conditions such as learning disabilities and other similar conditions. It will assess what an individual can do - rather than can’t do. Individuals with health conditions or disabilities will be given support and employment advice to enable them to return to work where possible. People whose condition causes very severe limitation of their ability, who are not able to engage in any work-related activity, will get a higer rate of benefit. They will still be able to volunteer to get support and employment advice if they want to. This measure is part of The Welfare Reform Act 2007. "Rather than categorising people on the basis of why they are unable to work, the service will focus on what support people need to help them move into work, regardless of their benefit type." Not much changes, the numbers keep rising. The UK is simply embarking on an elaborate relabelling process. Still, people wanting to hold onto their public service jobs (and consultants) have to be seen to be doing something. Here's some good news for fans of big government. Six new CYF offices are to open across the greater Auckland area. The first opened on Wednesday in Clendon. Now why does the name Clendon seem familiar to me. Ah yes. Because there are 1,616 people on the DPB using the WINZ Clendon service centre. And the number has risen over the past 5 years. Where DPB populations are concentrated, social problems are most prevalent. On that basis I should be able to predict where the next offices will open. Try Mangere, Manurewa, Otara, Papakura, Waitakare and Manukau, if they haven't already got one. It's the old story of some government intervention leads to more government intervention. In their attempts to meet need, they create it. There is a massive problem of children in need of better parenting. The majority of them will live in homes where nobody works and nobody teaches them constructive values. What a bind this country has got itself in. Sickness benefit numbers dropped by 4 percent but the net gain over the two benefits was 4,000. The sickness benefit has the same most common complaint as the invalid's benefit with 39 percent (up from 35.1 in 2004) of claimants in this category. 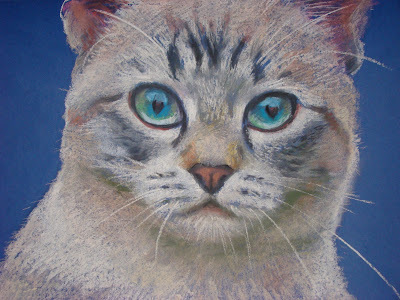 As I have blogged before the DPB has stalled. No surprises there. In the year to June 2008 the total is down by ..... 27. I wonder how much by way have resources has gone into achieving that stunning result. But I better mention the unemployment benefit, down by 5,000. I calculate this to be an overall drop of 1,000 but the remaining factsheet - all main benefits - insists the drop is 3,000 so there must be some movement in the more minor benefits like widow's or emergency benefits. At this rate we are on track to return to the kind of numbers common in the sixties and seventies by 2087. Not PC was wondering about whether smokers paid their way. More than. Current tobacco tax revenues amount to approximately $1 billion per year, and have been at that level for some years. This is just under 2 percent of total tax revenues. - Of the approximate $1.6 billion per year retail spending on tobacco products, approximately 70 percent is tax revenue, including GST as well as tobacco excises. - Thus, the average amount spent by New Zealand’s 750,000 smokers is approximately $2,135 each per year and approximately $1,500 is tax revenue. The cost of smoking-related health care to the New Zealand taxpayer is about $250 million. 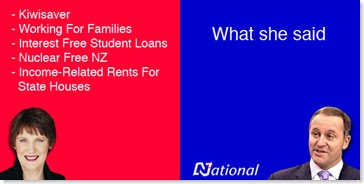 Can I be bothered blogging about National's housing policy? The most noteworthy aspect is its similarity to Labour's - again. They will return tenants right to purchase their state home but if this happens the state home stock will be replaced. "We won't be running down the state housing stock. We acknowledge that we need it." Mr Heatley said the party would now keep Labour's policy of fixing state house rents at only 25 per cent of the tenants' incomes except for tenants on high incomes. He promised to keep the accommodation supplement. He also promised to keep Labour's Housing Innovation Fund, which provides $12 million a year in capital for community groups providing shared-equity and other subsidised housing to low-income people. What this poll and others taken around the same time do show is that there will not be a walkover. This is healthy. Democracy thrives on the contest of ideas, policies and personalities, not on forgone conclusions. Except there is no contest of ideas. "What this poll" actually shows is that we are not living in a 'thriving' democracy. A thriving democracy would be one that is flourishing, prospering and growing rich. We are living in a tired, cynical, paralysed democracy that is deeply dissatisfied with the status quo but too scared to change it. I am one of the hundreds of thousands of parents who reluctantly acquiesced to the request that my children be given the meningococcal vaccine. It now emerges that the immunity is reasonably shortlived. Data from the MeNZB™ trials have shown that the detectable duration of immunity post-vaccination is measured in months rather than years. 1/ How many parents would have complied if they had known the immunity was short-lived? 2/ How are the parents of those children who experienced bad reactions to the vaccine now feeling? 3/ Was the $200 million campaign considered a one-off? 4/ Where has this site - www.immunise.moh.govt.nz - gone? 5/ How does one weigh up the risks against benefits when the real benefit is not known? 6/ Do any other parents out there recall being told that the vaccine was short-lived? 7/ How does the Ministry of Health propose to ensure all parents remain vigilant because their children may not have functional immunity? Another multi-million dollar information campaign? Update; Today's NZ Herald editorial sums up the situation well. This is from an Economist article about how violent the UK has become, in which we get a mention. 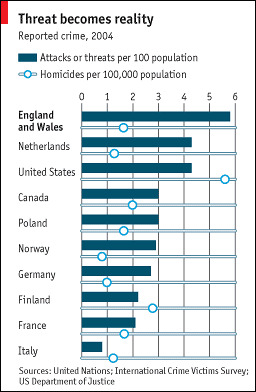 England and Wales are not unusually murderous (see chart). The homicide rate is higher than anywhere in western Europe except Finland, Belgium and indeed France (though Britain edges ahead of France when Scotland and Northern Ireland are included). But Britain looks gentle next to former colonies such as Canada, New Zealand and especially America. And it compares favourably with the EU average, thanks to the new eastern European states: in Latvia and Lithuania homicide is five times as common as it is in Britain. In 2006 New Zealand had 2.3 practising physicians per 1,000 population. That ranks us 18th out of 24 countries. Behind us are Korea, Turkey, Mexico, Canada, Poland, Japan. In 2004 there were 13,832 hospital discharges per 100,000 population also ranking us 18th - this time out of 27 countries. Well maybe that's because we are healthier? Perhaps not. For example where we don't want to rank more highly is in malignant neoplasms. In 2005 there were 172.9 per 100,000 population making us the 8th highest out of 24 countries. None of it is very encouraging. Relatively speaking, this is not a good country to get sick in. I have said it before but will say it again. We are now relatively poor. It is not a coincidence that the first two rankings equate roughly to our GDP per capita ranking. Rodney Hide interview on Agenda. It's straight and it's honest. GUYON Which government departments do you want to close? RODNEY Oh, which ones do you want to keep. We've had a massive expansion in size of the State, we've seen government expenditure grow in the last ten years by 80%. GUYON Okay, two government departments. RODNEY Oh well how about Women's Affairs, Pacific Island Affairs, Youth Affairs, the Families Commission and I've hardly started. We have government departments. GUYON They should all be closed down? RODNEY I think so what use do they do?